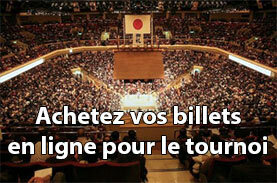 C’est désormais sûr : il y aura deux ôzeki kadoban au prochain tournoi, car Kôtôshôgiku n’a pu rien faire devant la maîtrise du yokozuna Kakuryû. 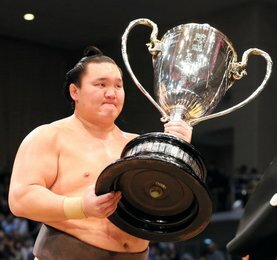 Ce dernier court toujours après son homologue, le yokozuna Hakuhô, qui après sa victoire contre le troisième yokozuna Harumafuji, n’est plus qu’à une étape de la coupe de l’empereur, et surtout d’égaler le prestigieux record de 32 yushô du yokozuna Taihô. Derrière les hommes de tête, les deux sekiwake se battent pour garder leur rang. 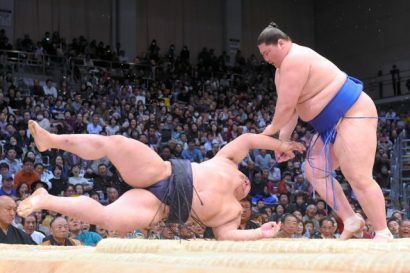 C’est atteint aujourd’hui pour Ichinojo qui s’est débarrassé de l’ôzeki Kisenosato, mais ce n’est pas encore le cas pour Aoiyama qui chute devant le mongol Teranofuji. Les deux komusubi sont eux loin derrière, condamnés déjà à redescendre chez les maegashira. Nouvelle victoire de Tochinoshin, d’ Endo et de Kyokutenhô qui restent dans le haut du classement. Osunaarashi lui aussi gagne, malgré une victoire tirée par les cheveux. En jûryô, Tokitenku a repris la tête, mais il faut noter la brillante place du jeune Kagayaki, premier tournoi en Juryô, et déjà 10 victoires! 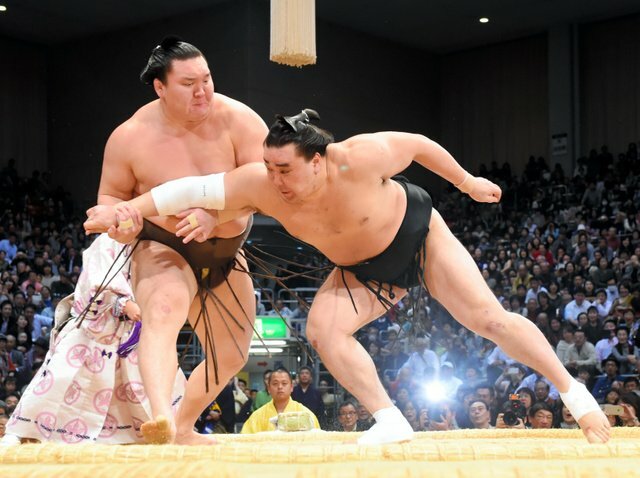 Yokozuna Kakuryu won his 12th match at the Kyushu Grand Sumo Tournament on Nov. 22 to set up a final-day showdown with Hakuho, who is looking to take home a record-tying 32nd career title. Calm under pressure, Kakuryu threw ozeki Kotoshogiku (6-8) to the dirt to keep alive his hopes of coming from behind to claim the title. 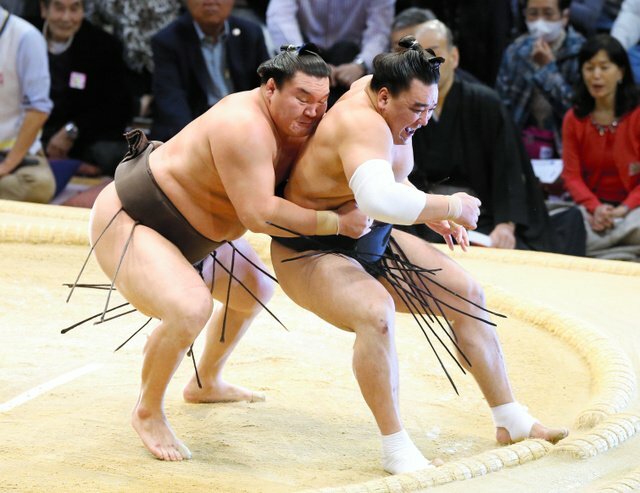 Kakuryu has two losses, but if he can defeat Hakuho on Nov. 23, the two Mongolian yokozuna will have to fight a tie-breaker to decide who captures the top honors. In the penultimate bout of the day at the Fukuoka Kokusai Center, Hakuho stopped Harumafuji cold at the face-off and sent him out from behind as his compatriot tried to recover from an overextended arm attack. 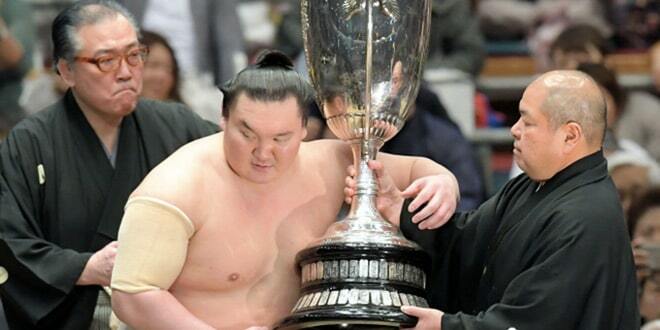 Harumafuji (10-4) never had a chance against Hakuho, who had a look of steely determination as the two squared off. 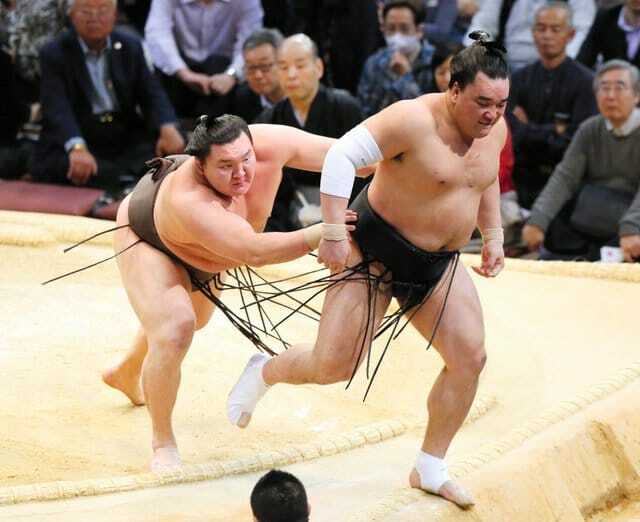 Sekiwake Ichinojo, who has been dubbed « Monster » for his intimidating size and scowl, jumped the gun once but then flipped ozeki Kisenosato out of the ring. With his eighth victory, the new Mongolian star is now assured of a winning record. He stunned fans with his 13-2 record in his top division debut in September. Kisenosato, at 10-4, appears to have hit a wall. 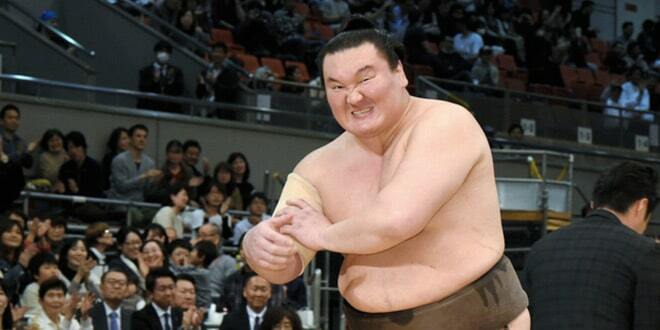 Fledgling ozeki Goeido suffered another loss after trying desperately to grapple maegashira No. 4 Kaisei to the edge. 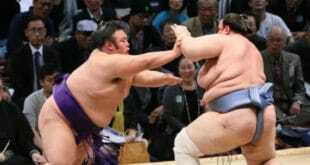 Although Goeido fought hard, the big Brazilian turned the tables on him and forced him down with an overhanded throw. Goeido has now lost nine matches, so he will need to prove himself worthy of staying at ozeki by scoring a winning record in January. Kaisei is 6-8. Sekiwake Aoiyama of Bulgaria was bulled out by maegashira No. 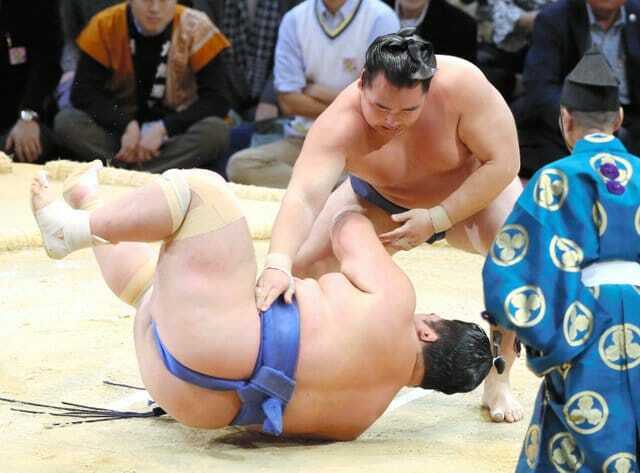 3 Terunofuji in their first match against each other. The new sekiwake needs to defeat maegashira No. 6 Toyonoshima on Nov. 23 to go home with a winning record. Terunofuji is also 7-7. Komusubi Ikioi and maegashira No. 2 Toyohibiki (4-10) had a bout that was too close to call in their first go, but Ikioi clearly and quickly won the rematch, bringing his record to 6-8. Suivant Finale : Hakuhô remporte son 32ème yûshô!